I'm a beginner, and I have two hives. One family is going strong and has lots of worker brood and drone brood, and there is a buzz of activity surrounding the hive. The other family was always a bit slower and smaller, but I find that activity has taken a dip, the bees are kind of sluggish, and there is no new brood of any kind and only a very little capped brood. They are building new frame and bringing in pollen, but compared to the other hive, they are very inactive. I went through all frames today without seeing the queen, but of course, I may have missed her. I'll be keeping an eye out for open brood. Is there anything else I can do? Could I maybe try to take one of the brood frames from the active hive and insert it in the sluggish one to see if they will produce a new queen? Yes taking a frame of "open" brood with eggs and young larvae from the strong hive and donating to the struggling one will give them the opportunity to create an emergency queen if they need to and boost the dwindling population of the hive once that brood hatches. Obviously you need to make sure the queen is not on that comb before you transfer it. Another option, since we are now in swarm season is to find someone who has excess queen cells and graft one or two into your failing hive.... they can be pinned onto the edge of the brood comb with a bit of wire or suspended between top bars with wire. The important thing is to ensure it is in the vertical position. The advantage of this is that if they do need a queen, it gives them 2 weeks head start over creating an emergency queen from brood. I'm guessing this was the first hive that you did the chop and crop on where you had difficulty capturing the queen in the clip and I'm wondering if she perhaps got damaged in the process....an easy thing to happen, so don't feel bad about it. If you are going to transfer a comb of brood, I would dust it and the bees on it with icing sugar or very carefully shake/brush the nurse bees off into the donor hive before you transfer and place the donor comb into the middle of the brood nest of the recipient hive. Bear in mind that the comb will be fragile since you have just done a chop and crop, so needs to be handled gently. Good luck recovering the situation. Today I took a quick look through the viewing pane, and activity was low with bees spread thin on the combs. So I made the decision to at least try with a comb of brood. I went through the other hive and found a suitable, not quite fully drawn, comb with open brood. I fastened the top bar from this to a top bar from the other hive and brushed off most of the bees and transferred it. I didn't see any varroa in the open brood. So now it's fingers crossed and hoping for the best. Well done. Would you keep this thread updated with it's progress. For your information, you will not see varroa in open brood. The female varroa mites crawl into the brood cells just as they are about to be capped to lay their eggs, so uncapping and removing developing pupae (usually drone brood, using an uncapping fork) is the only viable way to check for varroa in brood as far as I am aware..... not necessarily advocating doing that, but just making you aware of how it is done. Keeping fingers crossed that they resolve this issue with your help. Sure, I will keep you posted on how they are doing. I better leave them alone for a day or two. I was also offered a queen cell by some friendly beekeepers (they first need to check if they have any). Is it one or the other, or can I do both? If you can get a capped queen cell within the next few days it would be beneficial and I don't think the brood you gave them will impact on that although there is a risk that they will destroy the queen cell, so assuming you are not paying hard earned cash for it, I think there is more to be gained than lost by trying it. I found an abandoned virgin queen on the side of a hive last night and was thinking of you and wishing you lived closer. I offered her at the entrance but they balled her so presumably they had chosen a replacement after they swarmed and she was surplus to requirements. She was a nice dark queen too but clearly there was a bigger stronger one inside the hive. I watched for a while as she valiantly battled 15-20 workers whilst trying to get back into the hive, but when I went back later there was no sign of her. 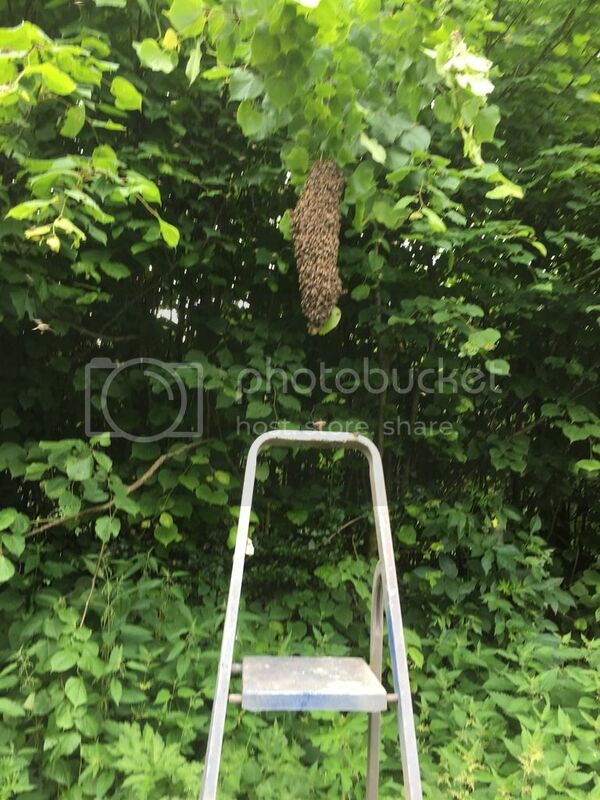 My brother who lives next door, saw a swarm returning to the apiary yesterday afternoon, which is pretty unusual, so whether she was part of that swarm and didn't find the entrance or there were multiple queens in the swarm and she was inferior or damaged, I don't know. Judging by the determined effort she made to enter the hive despite all her opponents, she seemed pretty strong. It was quite sad to see and would have been nice to have been able to send her off to a new home where she had a chance, but without even an entourage, she would be struggling. What a sad drama. Presumably the bees know best, and there is a lot to learn, and for me at least, it will be a steep curve this summer! I hope I will be able to lay my hands on a queen cell during the weekend. Yes, sad..... but today is another day and I am currently rejoicing in the birth of a new swarm, which I have just captured! We all have lots to learn but the curve does become a little less steep after the first few years! There would be no challenge if it was easy or we knew it all and where's the fun in that! As you know, that feeling of euphoria when you perform a successful operation like your chop and crop, is a big part of the attraction as well as some deep mystical fascination with these tiny creatures. Well the joy just turned to disappointment. They have headed off when I wasn't looking. I had left them to settle until this evening and was planning which hive I would put them into, but they have abandoned my trusty swarm catching skep and headed off to a new home somewhere else. My first failure to capture a swarm with my skep....actually my first failure to capture a swarm in quite a few years. That will teach me to count my chickens before they hatch! Oh no! That's too bad. Hopefully, they will swarm again next season and you may be lucky that the kids move back into your swarm skep. I got a hold of a queen cell on Wednesday evening and rushed back home to install it. Now, I'll keep my fingers crossed, and hope that the family makes it. Plenty more swarms to come I think....I've already captured two more cast swarms since my absconding one. I usually collect between 10-15 a year.... it still hurts when they thwart me and head off though. I had a few empty hives to fill this year which is really unusual, but I'm pretty much up to capacity now and ready to send the next ones on to new homes. Anyway, good luck with your queen cell. I hope it solves the problem. One snip and they are in the box..
Why can't they all be like that, you jammy so and so! Great! I hope to get one next year. I might need one. Right now, I'm busy battling bees and hornets that are snooping around my TBHs. Really jammy is when you don't need the step ladder to get them. About three years ago I got one like that and it was quite cold when I picked them up so they were clustered so tight, I didn't even need to put on fancy dress to get them. Yep to not needing the stepladder but I had one Sunday, was at ankle height in a bush and I got my knees all dirty. There is a queen! I went through the hive with my husband, studying each comb in turn. There's a great deal of honey/nectar stores, some sealed brood and some open brood, and on one comb we found the queen. We also saw some eggs. The activity in the hive has increased a little, and they don't seem so sluggish anymore. But whether it is a new queen, or I simply missed the old queen, well, I have no clue. Any idea how I can tell? There was no sign of the queen cell I installed two weeks ago - other than the toothpick still stuck in its place. Now it remains to be seen if this family will grow - it is still quite small. Well done! That is great news. Unless the old queen was marked or the new queen was a noticeably different breed, there is no way to tell as far as I am aware. They have been putting down lots of stores during that apparent queenless phase because they had very little brood to look after.... brood eats through stores nearly as fast as they can bring them in. Those stores will now stand them in good stead and I think there is reason to be very optimistic since it is still so early in the season. Always worth marking the Q IMLE even in low intervention management. And that lovely sausage swarm above absconded the following day.